· Meet Author: "...how an African American boy from the Jim Crow-era South... achieve great success"
· “My Journey From Indifference to Consciousness of Racial Inequality"
· Is one month for black history enough? Are you white? Watch this movie! Share. This blog focusses on Prince George's Co., but this is a problem throughout the United States (I don't know about other countries, but I understand classism is everywhere - would love to hear from people in the comment area about their experiences in different areas, though). What did you observie there? (If you can't hear it, see dialog text below.) A home service worker comes to do the job, gives his estimate to fix it (not unreasonable for what needs to be done) and he's turned away without being paid. This is not unlike a lack of tipping a waitor/waitress since it is about getting paid. In the U.S., certain service people are allowed to be paid much less because they're expected to make tips and others, like this service worker, probably works by commission or is self-employed, which means he doesn't make money if he doesn't get paid. And if he's self-employed, he has to pay over-head (telephone, transportation - cost of vehicle, gas, and repairs, insurance, office, accountant, etc. ), so not being paid would mean he loses money. If he works for a small business, that small business loses money AND he may not get paid if he's working by commission only. We're good at complaining about the big corporations making too much money and become monopolies, often not treating their customers well. But if we don't want big corporations, we need to help small businesses thrive. This is just one example. This situation happens to housecleaners and many other industries. This site shows the average pay for certain jobs and we can see how household services (not the supervisors so much as the actual workers) get paid less. We complain about the economy, but we can help each other make the economy better in some ways. If you can afford to pay for services, hire a local service - there are lots of sites that rate them and give information about them, and once you hire them, pay them. They should be able to at least give you a ball park of the amount it should be (if it's just a quick fix or if it needs a new part) - you should be able to get a range. If you can't afford it, don't hire them in the first place - sending them away without paying is unconscionable. So he decided to do it himself and made it worse. President Obama gave us a charge in his final speech, "...you are the best supporters and organizers anyone could hope for, and I will forever be grateful. Because yes, you changed the world.... I am asking you to hold fast to that faith written into our founding documents; that idea whispered by slaves and abolitionists; that spirit sung by immigrants and homesteaders and those who marched for justice; that creed reaffirmed by those who planted flags from foreign battlefields to the surface of the moon; a creed at the core of every American whose story is not yet written: Yes We Can." Yes we can participate in our democracy and be the resistance to racism, war, and other acts of hate and oppression. Prince George's People's Coalition met with several organizations (see details and photos on Facebook), including ANSWER Coalition (Act Now to Stop War and End Racism) which is gearing up to march on Jan. 20. Prince Georgians who will be joining them suggested the use of the hashtag #pgresist. Also take note of a discussion on the book "The Third Reconstruction: Moral Mondays, Fusion Politics, and the Rise of a New Justice Movement" by Rev. Barber at Paint Branch Unitarian Universalist Church on Jan. 15 - see this PDF with the announcement. Note: The above photo of Barack Obama was taken at Prince George's Community College in 2007 before most people even knew who he was. 5th-Apr-2015 12:24 am - Meet Author: "...how an African American boy from the Jim Crow-era South... achieve great success"
Congressman James E. Clyburn, 3rd highest-ranking Democrat in the House of Representatives, will discuss his book titled, BLESSED EXPERIENCES, at the Oxon Hill Library, 6200 Oxon Hill Road, Oxon Hill, MD, on Thursday, April 9, 2015, at 1:30 p.m.. Please join us at this event. Ark Media is seeking African American families from Prince George’s County, Maryland for a story about the Black Middle Class, as part of a four-hour PBS documentary series. This series -- tentatively entitled FROM BLACK POWER TO THE WHITE HOUSE — takes viewers on a journey through the last half-century of African American history, exploring the unprecedented progress and lingering obstacles to racial equality since the landmark legislative victories of the civil rights movement. The series will be hosted and executive produced by Professor Henry Louis Gates, Jr., and will air on national PBS in 2016. We are looking to interview a family from Prince George’s County as part of a discussion about the growth of the African American middle class. We’re interested in the factors that drew you to your current neighborhood, your experiences living there, and the changes your neighborhood has undergone since your arrival. Please feel free to forward this message to your contacts. Please reach out to Eu-Hua Chua, Associate Producer at e.chua@ark-media.net or (718) 935-9745 ext 107. • Taking Action: actively seeking to heal the wounds of racial inequality and injustice and to support racial reconciliation between individuals, within families, and in communities. After the meeting, we hope you can join us for 1st Saturday at Davies, a free blues jam/open mic session from 1:30-5:00. You can join us for a meal (Chili and fish will be served for a small donation), play your own instrument, meet other musicians, find a band, practice skills before a live audience, and listen and dance to the house band Anthony’s “Swamp Dog” Clark & The All Star Blues Band and an Ebra African Music and Dance Troupe. If you will be able to attend, please RSVP by November 30 to: Lynda Davis at lyndadvis@aol.com or (410) 636-4587. Thank you! On Dec. 6, Saturday 11:00 AM – 1:30 PM, the Washington Area is having a Coming To The Table gathering - Coming to the Table provides leadership, resources and a supportive environment for all who wish to acknowledge and heal wounds from racism that is rooted in the United States’ history of slavery. Descendants of enslaved people and enslavers, gather together for sharing and learning. We will discuss Reconciliation and Coming to the Table's Vision, Mission, Values, and Approaches. We extend a special invitation to European American descendants of : slaveholders, slave catchers, slave traders, and others directly or indirectly involved in the slave economy (banking, insurance, mortgage lending etceteras) and have a need to talk about it. This program is being hosted by Davies Memorial Unitarian Universalist Church at 7400 Temple Hills Rd., Camp Springs, Maryland. Contact Lynda (lyndadvis [at] aol.com) by November 30 to RSVP. Also, join Davies Church for A Dialog on Race and Ethnicity on Fri., Nov. 14 - potluck preceding is option and starts at 6:30 PM. On October 2, a coalition of groups will invite parents, youth, adults and community leaders to be a part of a training and discussion, "Moving Beyond Ferguson: Know Your Rights Community Forum." There will be a panel of experts, followed by discussion on the topics of your rights when interacting with police, racial disparities within law enforcement and the justice system, preventing police brutality, and sharing solutions. Co-Sponsors: ACLU of Maryland, Prince George's County Branch of the NAACP, 100 Black Men, Men Aiming Higher, J. Franklyn Bourne Bar Association, Flowers High School, Prince George's Human Relations Commission, Judge Alexander Williams, Jr. Center for Education, Justice & Ethics, Inc. and Casa De Maryland. WHAT: Training and panel discussion, "Moving Beyond Ferguson: Know Your Rights Community Forum." WHEN: Thursday, October 2, 2014 from 6-8 P.M.
See: News about Racial Issues in Prince George's Co. click here. Subscribe to this blog via email here. Almost every day we see something on the internet now. Still do we all see it the same? Blacks are tired of talking about it as the CNN reporter who just wanted to warn people so they don't get into trouble (not a bad idea because they will get into more trouble than Daniele), but in the report, it almost looks like she didn't understand why Daniele put herself out to show what is happening in this country. Will white people talk with black people about race? Yes, they do at A Dialog on Race and Ethnicity, which will be held again on the 2nd Fri., Oct. 10. Bring your friends of any race or ethnicity. 10th-Sep-2014 10:10 pm - “My Journey From Indifference to Consciousness of Racial Inequality"
Lynda and Rusty Vaughn, members of Coming to the Table who are descendants of African slaves, slave traders, slaveholders and those whose family fortunes relied on slavery, will be speaking about their journeys from indifference to consciousness of racial inequality at Davies Memorial Unitarian Universalist Church this Sunday, Sept. 14, at 10:30 AM. They ask us to consider,"Can Humans Override Their Reptilian Brain?" The event, sponsored by five AAHGS Chapters, will be held from 1:00 p.m. to 4:00 p.m., on Saturday, September 20, 2014, at the Suitland Family History Center, 5300 Auth Road, Suitland, MD 20746. We ask that you distribute the flyer to friends family, neighbors, libraries, organizations,etc. Please feel free to submit the flyer for publication to your local newspaper or various calendars. Also, please go onto Tim's Facebook Events' Page and talk about your newspaper research successes and challenges. Tim will use some of these submissions during the program. Thank you for your assistance in publicizing this event. Hope to see you soon. Note: The door prizes are three copies of Tim's book "Finding and Using African American Newspapers". Starting on page 34 in this online magazine, Living Education eMagazine, is a wonderful article “Teaching and Celebrating Diversity in Schools: My Experience as a Teacher and Researcher in Prince George’s County Public Schools” by Dr. Arvenita Washington. She tells a story of immigrant African students who could not walk in a straight line in the halls of the school, not for the sake of defiance, but due to remembering being forced to do so in their home country and seeing some pulled out of the line and killed. She explains how truly multiculturally diverse this county is. She also tells of Afro-Latino/a who could not choose just one identity even though they were being compelled to do so. She challenges teachers to think out of the box about the diversity in their classrooms and to strive to create equitable multicultural school environments. Prince George’s African American Museum and Cultural Center Needs Your Help and Your Voice at The County Operating Budget and Capital Improvement Program Hearings on April 29 and May 5. The Prince George’s County Council Public Hearings on the County Budget are fast approaching. The County Operating Budget and Capital Improvement Program Hearings are scheduled for Tuesday, April 29 and Monday, May 5, 2014 at 7:00pm in the Council Hearing Room of the County Administration Building, First Floor, 14741 Governor Oden Bowie Drive, Upper Marlboro, MD. PGAAMCC is scheduled to present its request for funding for the completion of the museum building in the heart of the Gateway Arts District. We need $4million to make an 18 year old commitment finally come true. In the mid 90’s, a group of citizens in North Brentwood, the oldest incorporated Black township in Prince George’s County, knew that they had a duty and an obligation to ensure their history was not forgotten by future generations. The Friends of North Brentwood was established to build such an institution. In August 2010, PGAAMCC became an independent private 501(c) 3 institution with the mission of building a museum to tell the Countywide stories of the contributions of African American and African Diaspora peoples to the development of Prince George’s County. Today, we are trying to make the Founders’ dreams finally come true. Our programs have attracted international and national attention. At the Mall at Prince Georges families participate in our Early Keepers program of music, dance, art and storytelling for 3 to 7 year olds. We work with the Arc of Prince George’s and are a veritable staple of the School System for our work with our Museum In A Box displays. Our Culture Keepers program at the Suitland School for the Performing Arts works with the youth program at the Afro Museo in Sao Paulo Brazil. Our students will travel to Brazil to meet their counterparts and share research. Later in the year our students will host their Brazilian counterparts in our county. We are the only museum in the country to have a museum studies internship project with a community college workforce services program (Prince George’s Community College). Last year we served over 25,000 people with only 6 full time people and one part time staff person! We need to build the 10,000 sq. ft. addition to complete the Museum. It will have performance, events, classroom, and meeting spaces, as well as a coffee shop, gift counter, and a 4,000 sq. ft. Gallery (already completed!). If you feel that this project is worth completing, please come and add your presence and your voice to speak on our behalf at either of the two hearings listed above. Please help us go the last mile of the way in making this dream a constructed reality! Can we count on you to speak and bring others with you who are willing to stand with us? If so, please click on the links above to contact Tracey T. Jones, Director of Media and Public Programs. She can be reached at ttjones@pgaamcc.org or (301) 809-0440 x111. Let the County Council know that Prince George’s County’s African American History and Culture are important to YOU and that this institution is critical to its dissemination. Most people understand what "Driving while black" means and if you don't you probably aren't black or don't know anyone well who is. I understand that this experience hasn't changed much in the last 5 years. President Obama has the privilege to not have to drive and thus not have that experience. Or does he actually have that experience, but in different ways? Possibly even more so. 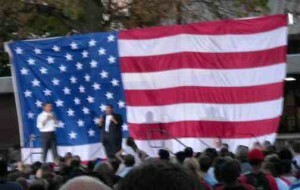 Back in 2007, 6 months before the primaries, as a volunteer I noticed how organized Obama and his campaign staff and volunteers worked on security. I went to one other Presidential campaign session prior to the primaries and didn't see any security like that. Could the color of his skin make that kind of difference? I think Obama knew about race politics in this country then and might have had an idea that it would get worse before it got better. You can read the article to get descriptions on those kinds of racism. I didn't add racism to the title of this article. Would you have read it if I did? He says that most racists are not bad people, even most conservative whites are not haters. As someone who's working at anti-racism, I questioned someone's choice of pet in terms of their choice of friend - since I thought that friend knew I didn't think of them as racist, I thought they might find humor in the way I stated it. Unfortunately, it backfired on me and the person thought I was accusing them of being racist and was very defensive. It is an emotional topic and very difficult to discuss. We have a long way to go. Poll #1961674 Racism in the Obama Era? Prince George's Suite is running Prince Georgian of the Week series. Each is proud to live here, often citing its diversity. The latest, Danielle Basilio, says, “Prince George’s County epitomizes diversity – geographic, educational, cultural, and social. I am honored to be affiliated with a county that embraces diversity and utilizes resources to “elevate” the community.” I feel the same way. Article about diversity vs. white-superiority written recently is here. It started a little conversation on my Twitter account from someone who is "not racist" but doesn't understand anti-racism (fighting to end racism). Optional potluck at 6:30 p.m. Discussion begins at 7:30 p.m.
Open Discussion: Participants are encouraged to share and discuss events or situations that prompted them to reflect upon their own racial identity. Where, when, and who prompted the then alien (and wrong-headed) idea that human slavery was immoral? What was your take-away from the PBS television 3 part series on African American History that was recently shown in Oct and Nov of 2013 and in Feb 2014? One way to strike out against racial prejudice is not only to learn our histories, but also to identify as or with another race as close as family. Three such women who've done that spoke at a special presentation in Prince George's County. Read about it here. Also check out the Washington Post article about the local chapter of Daughters of the American Revolution (DAR) who are helping to increase the black population of the DAR. They would like to see more Native American members also. They don't just increase their own knowledge and diversity of this group, but they also do community service and education. 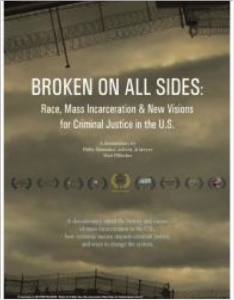 Broken On All Sides is a documentary that centers around the theory put for­ward by many, and most recently by Michelle Alexander (who appears in the movie), that mass incarceration has become "The New Jim Crow." That is, since the rise of the drug war and the explosion of the prison population, and because discretion within the sys­tem allows for arrest and prosecution of people of color at alarmingly higher rates than whites, prisons and criminal penal­ties have become a new version of Jim Crow. Much of the discrimination that was legal in the Jim Crow era is today illegal when applied to black people but perfectly legal when applied to "criminals." The prob­lem is that through subjective choices, people of color have been tar­geted at significantly higher rates for stops, searches, arrests, prosecution, and harsher sentences. So, where does this leave criminal justice? Doors open at 7 pm; films begin at 7:30 pm; a discussion follows the film. 21st-Dec-2013 01:33 am - Is one month for black history enough? Are you white? Watch this movie! Share. How did the Irish and German become "white"? Do you think about yourself as white if you check "white" on surveys? Do you think about your race? Communicate! Record. If something like what is portrayed in this video (link goes to article but ebedded video should be below) happens in Prince George's County, please let us know. Comment to @PrinceGeorgians on Twitter or to this blog or on Facebook. The public needs to be aware. I know we used to have these problems, but I hope the police are doing much better here - they say they are, but here's a report. Any other kind of racism, too, could be reported to us, because we are Prince Georgians who Care. Racial oppression can come from people who are not white also. Whites can be victims of racial discrimination/harassment, though it's not really oppression (which the word "racism" means) if the person who's doing it, or the people who have control over the person doing it, doesn't have more power than the white victim (see "The Myth of Reverse Racism"). This page was loaded Apr 24th 2019, 6:37 am GMT.